Mississippi born and raised, Jimmy Elledge crashed the charts in the early '60s with his Chet Atkins-produced rendition of Willie Nelson's "Funny How Time Slips Away." Jimmy started out singing and playing piano in the Future Farmers Of America Hillbilly Band during his early teens. While most of the group's repertoire consisted of the country songs of the day, Elledge handled the rock 'n' roll segment of the set, often performing his specialty, Jerry Lee Lewis numbers. He would later immortalize his rockin' piano style on one of his first discs, "Swanee River Rocket." Besides his Atkins-produced RCA sides, Elledge made the Nashville Record Row rounds throughout the '60s, waxing sides for Spur, Hickory and, most impressively, Aubrey Mayhew's Little Darlin' label, where he recorded alongside a young Johnny Paycheck. Little Darlin' released an LP on Jimmy, complete with a cover portrait of him standing in front of the Fontainebleau Motor Hotel, located catty corner from the Rock 'n' Bowl! Long a Bourbon Street favorite, Elledge swapped sets with the Meters at their first-ever gig at the Ivanhoe around the same time. Although he's always prided himself for his ability to sing and play in virtually any style—and his earth-shattering falsetto can lend feeling to any song that he lays his hands on—country soul is his unintended specialty. His renditions of Roger's Miller's "A Golden Tear" and Margaret Lewis's "Reconsider Me" are the stuff of legend, taking on lives of their own when Jimmy belts them out. 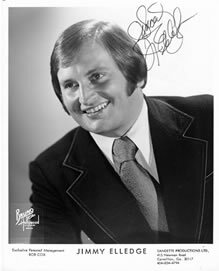 Elledge also happens to be the torch bearer of the great Floyd Cramer "Last Date" style of piano playing. All this and more have been earning him accolades in the South—and in particular, the New Orleans area—for over four decades.